Designed with input from law enforcement officers, this soft-sided case from 511 Tactical provides room for a single pistol. 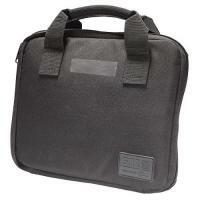 Its wear-resistant black nylon sides are backed with dense closed-cell foam to protect the contents from impacts. It also features lockable YKK zippers that prevent unauthorized access, and a markable name stripe for personalization. Inside the bag, a zippered and insulated compartment holds your pistol, while five elastic straps in the other side provide space for magazines, accessories or other pieces of equipment. The bag's heavy-duty nylon handles make it easy to carry. Not as good as my other ones that I have, but it is good.